Mmmm, doesn't that look good? Oh, it is good, real good! You don't have to sit there drooling over it, you can make it yourself. It's a pretty easy recipe that I'm able to make and assemble within a half hour. And I'm hoping to help with pictures so that making it will be a breeze for you. Not only is it incredibly delicious, it's not totally bad for you! Oh, and you may even get a slight buzz eating it! 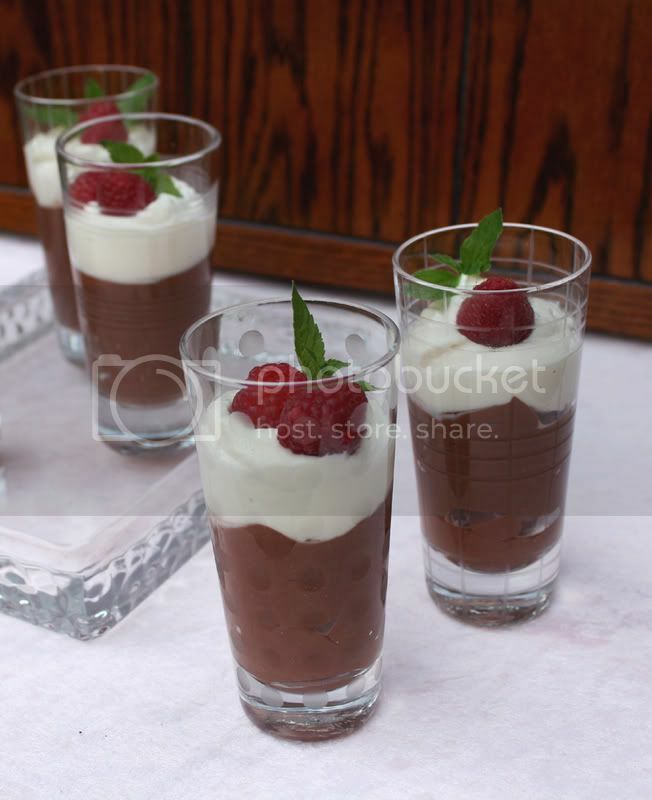 Both the chocolate part of the parfait and the cream part are spiked with Chambord. I felt very pleasant after having a parfait this evening. 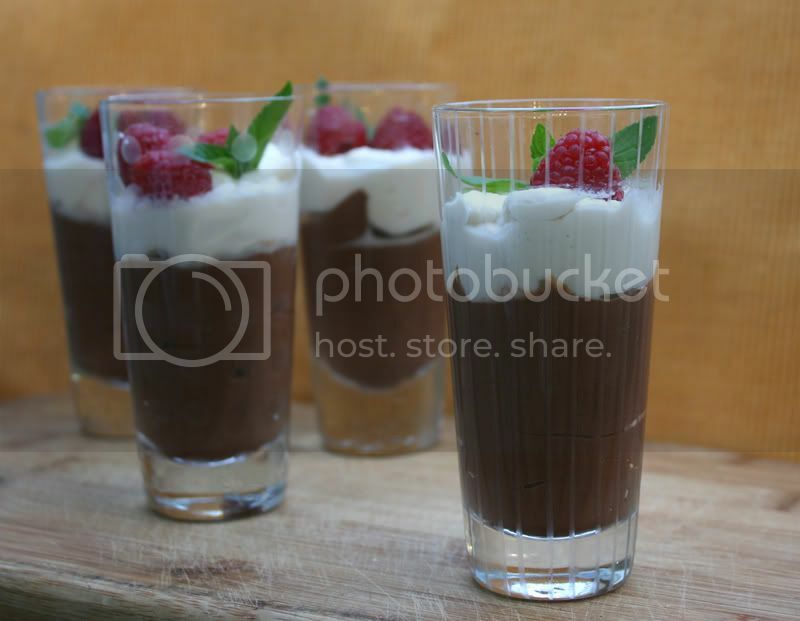 By the way, these parfaits in the picture were in tall shot glasses. I happen to have gotten a deal on them at Pier 1 this past week. 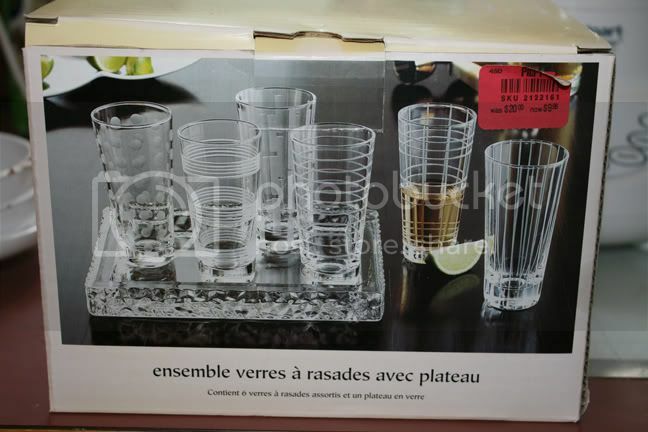 The set was only $10. They are the perfect sized glasses for this dessert. Now, if you are looking at the ingredient list, wincing, just stop! You and the people you serve would never know the secret by tasting this luscious dessert. I'm not exaggerating, honest! Getting down to the details, the base for the chocolate part of the parfait comes from my adaptation to an Alton Brown recipe called Mooless Chocolate Pie. Well, the chocolate base remains mooless, but I added in the "Moo" with the Chambord-flavored mascarpone cream. The mascarpone cream is basically the same recipe I used with the corncakes that I made in May. 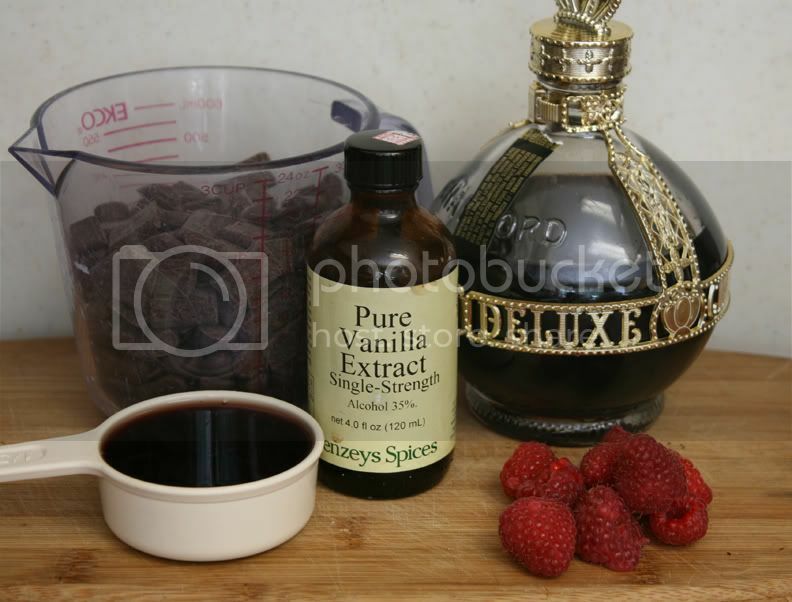 But instead of rum I used Chambord, and I doubled the amount of it! Yum! Hey, there's plenty of calories and fat in the chocolate, cheese, and cream in this recipe. So I reasoned that it was enough, and I could spare a few extra calories and fat by using tofu instead of more cream in the chocolate base. If you want to know why I sometimes cook with tofu, then follow the link! If you are used to using tofu, and you want to save even more calories, you can use the light silken tofu. These parfaits in the picture use the light. In the entire brick of tofu, there are only 150 calories and 5 grams fat. Look at these parfaits! They are every bit as wonderful as they look. Go ahead, try it! You will need to melt the chocolate to begin this recipe. 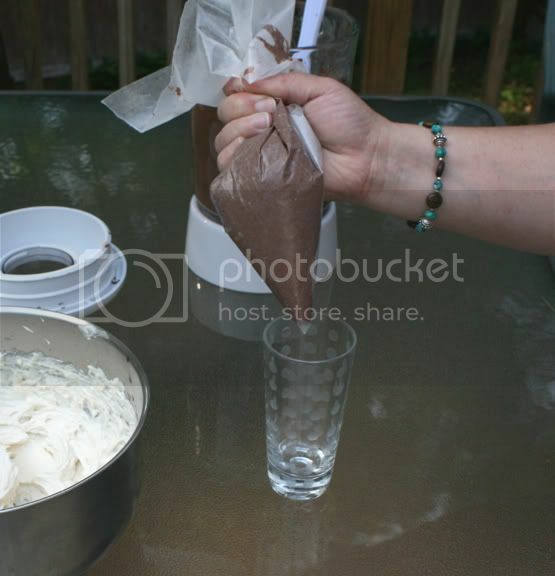 If you are unfamiliar with melting chocolate, this next section should be helpful. Chocolate is a fussy ingredient. The best way to melt it is to use a double boiler. But hey, not all of us have a double boiler (myself included). So here's what to do. Add 1/2-1 inch water to a small pot. Have a glass or metal bowl that comes close to fitting on top of it. You will notice in the picture below that my glass bowl is too small. It would fall right in if I let go, so I have a trick that I learned somewhere along the line (probably from Alton Brown). Take a big piece of tin foil and loosely bunch it up into a snake-ish figure. put it on the rim of the pot. Now when I put the glass bowl on the rim it fits great! It's good and sturdy and I'm ready to melt chocolate. Heat up the assembled double boiler on a medium-low flame. 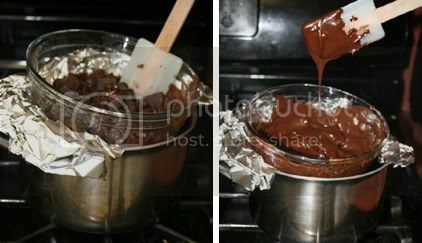 Add the chocolate chips to the top of your double boiler. 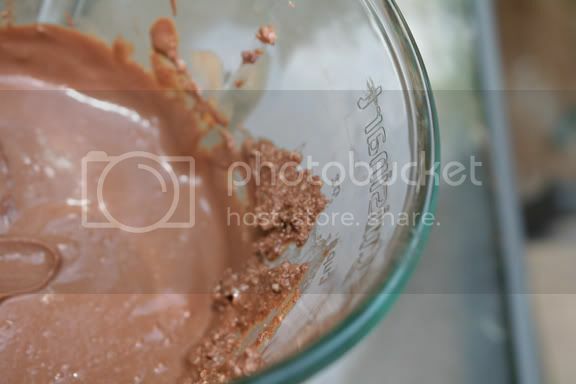 Begin stirring almost immediately and continue to stir till you have nice, smooth, melted chocolate. Add the Chambord and vanilla. Stir into the chocolate and remove it from the stove top. Cut a slit in the plastic cover of the tofu and let the water (there won't be much) drain out of it. Then place the tofu in the blender. Scrape the chocolate mixture in on top of the tofu. Pulse the blender to blend it all into a smooth, thick, pudding-like substance. 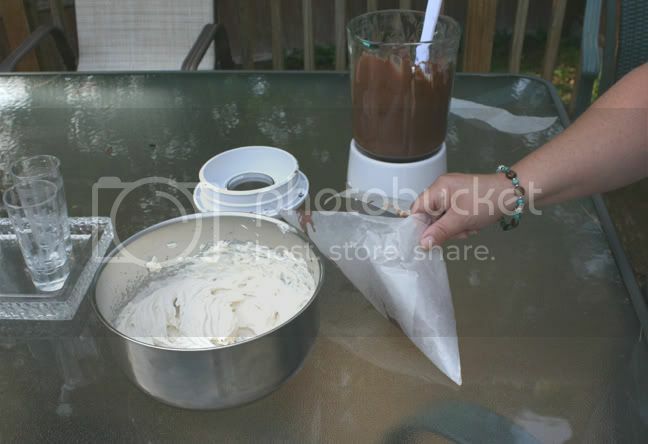 To get the mixture to blend, you will need to scrape the sides with a rubber spatula. You may also need to add a tablespoon or two of milk if it is too thick. This is what the mixture look like. Notice how not smooth the mixture is that is on the upper part of the glass. It's the stuff that is lower in the blender that is totally smooth and creamy - just like pudding. Whip the heavy cream in a metal or glass bowl until firm peaks form. Add in the mascarpone and beat until you have smooth peaks. Add in the sugar and Chambord. Beat until blended. Now you are ready to assemble. Without getting the chocolate on the edges of the glass, pipe it into the glass. You may have some air bubbles. If so, try tapping the bottom of the parfait glass onto a firm, but soft surface. You need to tap hard enough so that the air bubble collapses, but you don't want to break your glass. Now pipe in the mascarpone cream in the same way. Garnish with fresh raspberries and mint. What a great make-ahead dessert...would be really useful for party time catering too! okay I need to quit drooling and try to make these, they look delicous! These are so lovely! Just perfect and compact. Love them and I adore Chambord. I love this idea. I've been getting really into parfaits lately, because they're cold and I have lovely glasses to put them in. Normally the combination of liqueur and tofu would worry me, but I've been doing a lot with silken tofu and chocolate lately and found that they really are a match made in heaven! I absolutely love this recipe. It looks perfectly light but still chocolatey and satisfying! pretty! doesn't sound incredibly difficult either. I ate one of these today and it was wonderful! Yes, I got a slight buzz. No, I would have never guessed it had tofu in it. And, er, um, sorry I bad mouthed tofu before I tried this...I really want to eat another! Your recipe is great! I love it! I modified your recipe to Japanese gauge and ingredients so that I can enjoy it here in Japan. 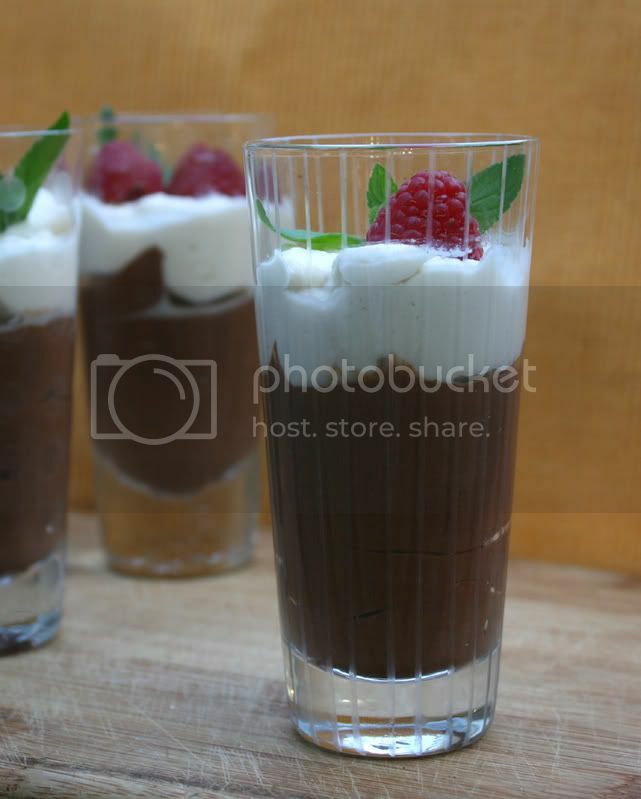 I'd liket to introduce this sweet dessert to my Japanese friends by posting the modified recipe to COOKPAD, the biggest recipe sharing SNS in Japan as "smooth and fluffy tofu choco pudding." I hope you don't mind my quoting, modifying and citing this blog, thank you. My Little World Of Food becomes Inspired Bites! I'm Meryl. I live in MA. I love food, cooking, and photography. Those all come together here, on Inspired Bites. ¡Gracias a ti, Elle! Este premio me da mucha felicidad.